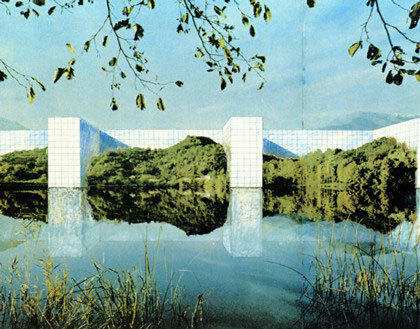 Founded in Florence in 1966, and composed by Adolfo Natalini, Cristiano Toraldo di Francia, Roberto Magris, Piero Frassinelli, Alessandro Magris and, from 1970 to 1972, by Alessandro Poli Superstudio carried out research on architecture until 1978. Superstudio's experimental activity began with the exhibition "Superarchitettura" (1966), together with Archizoom, and continued over the years with design, educational footage and utopic projects. In the 'Monumento Continuo' (Continual Monument), 1971, in the 'Dodici Città Ideali' (Twelve Ideal Cities, 1971) and in the 'Cinque storie del Superstudio: vita, educazione, cerimonia, amore, morte' (Five Stories of Superstudio: life, education, ceremony, love, death, 1973), utopia, pessimism and irony are integrated with a research aimed at the demistification of language, and at a theoretical-philosophical refoundation of architecture. Together with 9999, they run the educational seminar S-Space (1969) at the Space Electronic in Florence. They took part in the exhibition "Italy: the new domestic landscape" (1972) with one of their proposals for a space to live in, and in the XV and XVI Milan Triennale. In 1973, they were among the founders of Global Tools.